When choosing glass bottles for your essential oils, you will have a variety of colors to choose from. While it may be tempting to choose the most visually appealing color, you need to factor in how light will affect your product. As an essential oil vendor, which colored glass should you purchase to best suit customers’ needs? Each color has its own aesthetic and protective factors. In order to make the best decision for your products, factor in light protection, shelf life, and marketing. In regard to light protection, the darker and more opaque the glass, the more protection it offers against oxidation. Oxidation breaks down the oils and negate the therapeutic value of essential oils over time. Light can be broken down into two categories along the electromagnetic spectrum: invisible light and visible light. The invisible light that is most concerning for colored glass for essential oil bottles is ultraviolet light. Sunlight contains ultraviolet radiation (UV rays) that are harmful. In fact, these rays are why we wear sunscreen and sunglasses—we want to protect our skin and eyes from UV ray damage that can turn into skin burns and skin cancer. These UV rays destroy our skin cells in the same way that it degenerates the makeup of essential oils. Rapid oxidation alters the chemicals in essential oils, causing them to break down and be less effective. The science behind oxidation in glass bottles involves wavelengths of light, which are measured on the electromagnetic spectrum. A wavelength is measured in nanometers, whereas 1 nanometer (nm) equals 1 billionth of a meter. Ultraviolet light from the sun is 10 nm to 400 nm in length. The light that we see naturally is measured at 400 nm to 780 nm. Amber glass offers a protection against light wavelengths within the 10 nm to 400 nm range. This is the ideal spectrum to protect against UV light radiation, which is why many pharmaceutical and beverage manufacturers choose amber bottles. While blue and green bottles may be more visually appealing, they do not offer as much protection to your oils. These colors provide protection against visible light, but are unable to protect your oils against UV rays. They are also typically a little more expensive than amber or flint bottles. Should you ever choose clear glass bottles for essential oils? Clear glass bottles, also known as flint glass, will not directly deteriorate the integrity of the oils. However, these bottles do not offer any light protection. 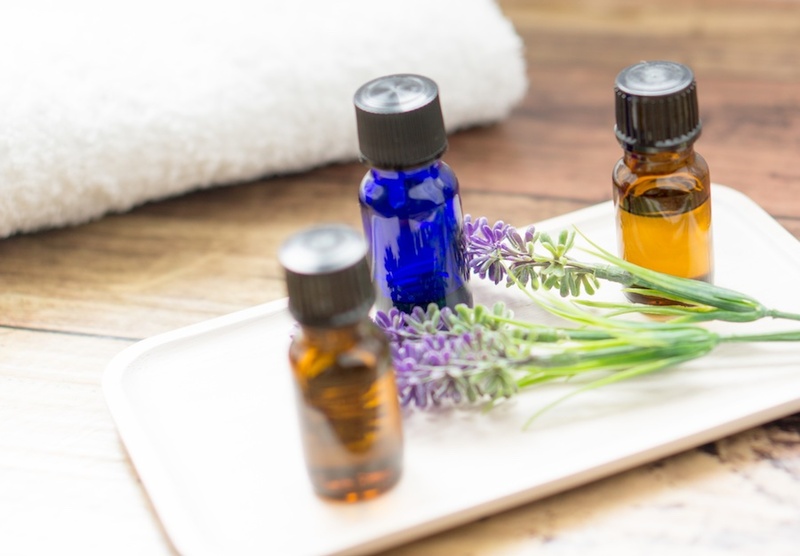 For essential oils that are apt to break down due to oxidation or that are used much more slowly, i.e., the number of drops per application, clear glass is not the best option. However, there may be times when you can go with a different color for glass and still be safe with consumers. If you are packaging an essential oil that does not have a long shelf life or will be stored in a dark space, then lighter glass colors can make their debut. If you opt for a clear glass bottle, make sure to include instructions about storing away from light. Or choose clear glass only when packaging oils that must be used in a short time frame, or that are used more liberally and do not last as long in the bottle. Another way to get around the need for an amber or darker glass color is by choosing a solid, wrap-around label. This type of label will cover the bulk of the glass, blocking both invisible and visible light. The customer will be able to see into the top or bottom of the glass bottle so they can see when they are running low on product. This can be a selling point with clear glass—the ability to see their product, which is not an option with amber glass. 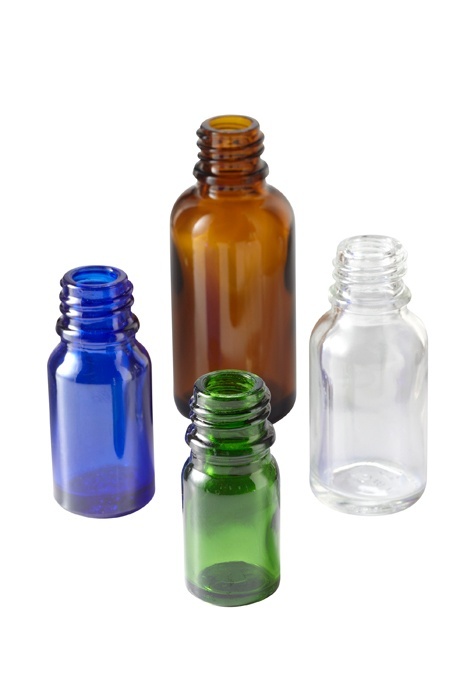 Choose the best colored glass for essential oil bottles in order to protect the product and enhance your brand. Essential oil customers will want to work with a company that offers a wide selection of colored glass bottles and understands the uses for each one. After all, it is their money that will be wasted if their essential oils lose its therapeutic effect. To learn more about choosing the best colored glass for your next essential oil packaging project, contact our sales representatives at Carow Packaging to schedule a 15-minute consultation. We will help you make the optimal choice for your clients based on light protection, branding, and budget.